Pat Cahill - I want a comedy night! 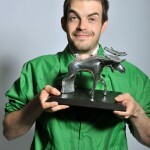 Something of a chameleon is former Chortle Best Newcomer and Hackney Empire New Act of the Year Pat Cahill. Just as you’ve decided to label him as a comedy rapper he effortlessly shifts forms to something as diverse as physical comedy or maybe even a quick work out with some props, all lovingly sprinkled with first class one liners. . If you love your comedy weird, wonderful, stunningly original and wholly unexpected then you’re going to love Pat Cahill.